1.Although the ash content is only 0.5%, the flour has a dark colour. Why is that? There are wheat varieties with a higher pigment content (compare, for instance, U.S. Hard Red Spring Wheat with U.S. Hard White). 2. How can I brighten the colour of the flour? Chlorine, Chlorine dioxide (both are gaseous) or benzoyl peroxide (powder) can be used for bleaching. In contrast to chlorine and chlorine dioxide, benzoyl peroxide has almost no maturing effect on the flour. The treatment with benzoyl peroxide takes 24 – 72 h to become visible. 1.What are the most important vintamins and minerals for flour fortification? The most important vitamins and minerals for flour fortification are folate and iron. Other substances often used are the vitamins B1, B2 and niacin, and also the mineral zinc. Vitamin A is only added to flour in a very few countries, possibly for reasons of cost. 2. What is the basis for the legal requirements in countries where fortification is prescribed by law? The legal requirements depend on the specific needs of the population in each country. These are determined in studies carried out by various organizations such as UNICEF, WHO and FFI. The FFI also recommends fortifying flour with at least iron and folate in every country. 1.Do the lipids present in wheat play an important role in the processing of wheat flour? Wheat flour lipids are mostly unsaturated lipids. When the kernel is milled, the lipids are exposed to endogenous enzymes and to oxygen, which results in rancidity. More than 50% of the lipids are located in the bran and the germ. So thorough separation is a prerequisite for a long shelf-life of the flour with unimpaired sensory properties. Flour lipids, and galactolipids, improve the volume yield of baked goods. 2. What is the composition of the wheat lipids? The wheat lipids are composed of roughly 1/3 non-polar lipids (oil) and 2/3 polar lipids (lechitin, galactolipids and others). They contain mainly unsaturated fatty acids. 3. Do the phospholipids contained in the wheat fats have any technological significance? They most probably contribute to volume yield. 1.What is Gluten? Gluten is often equated with the proteins of the wheat that are insoluble in water. It is a fact that glutenin and gliadin are the main constituents of gluten in terms of quantity and determine its basic character. 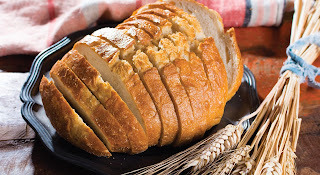 But smaller components such as lipids or pentosans are firmly and in some cases even covalently bonded to the gluten and have a corresponding influence on its properties. Commercial gluten (dried vital wheat gluten) also contains starch and minerals that cannot be completely removed by aqueous extraction. That is why dried gluten only contains about 80% protein. 2. Is there a connection between the quality of the protein and its chemical structure? The baking properties of wheat flour depend to a large extent on the amount of protein, the ratio of gliadin to glutenin and the properties of the latter, especially the disulphide bridges. 1.What is the percentage of starch in wheat flour? Wholemeal flour contains 60% starch, and light-coloured flour with an extraction level of 75 to 80% contains about 70% starch. In both cases this is based on a moisture content of 14%. 2. What are the differences between the starch fractions? Wheat starch consists of about 25% amylose and 75% amylopectin. The amylose is made up of glucose chains, i.e. of linked alpha-D-glucopyranosyl groups joined to the C1 and C4 atoms, with very few branching points at some C6 atoms. One amylose molecule contains about 200-2,000 glucose sub-units. Amylose molecules have the structure of left-handed single or double helices. Amylopectin is a much larger molecule (approx. 6,000-100,000 glucose sub-units) characterized by frequent branching at the C6 atom. 1.What is a variety? A wheat variety is characterized by specific attributes such as resistance to weather conditions, enzymatic activity or growth height. 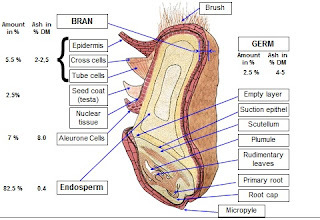 Other objectives in breeding a variety are its protein content and the properties of the gluten. Varieties are usually approved and then checked again and again through monitored cultivation. 2. How is a wheat class defined? A wheat class comprises all those wheat varieties complying with the definition for the class, e.g. colour, hardness, protein etc. The names of the classes and their definitions are characteristic of each wheat growing nation. But even similar names (e.g. Hard Red Winter) do not necessarily mean that identical quality parameters are used for classification.